The Copperhead is a microprocessor controlled dual battery management system (DBMS) and is used in situations where 2 batteries are placed in a vehicle, for example in boats, campers, off road and freight vehicles, service vehicles. The Copperhead can also be used as a voltage-dependent switch. 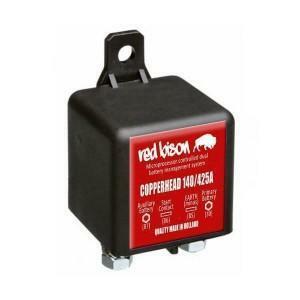 The Copperhead is a high power mechanical switch that is controlled by a microprocessor. When using two batteries, the microprocessor will monitor the battery voltage on the battery. The copperhead has a startup option. If you connect the startup jack to the Land Rover Defender (White Red wire), the Copperhead will switch the 2nd battery during startup. In some cases it is desirable that large 12V or 24V consumers can only be used if the dynamo is active. Connect the Copperhead as follows: Connect the + of the starter battery with connector 30, connect the earth (minus) to the connector 85 and + of the connector to connector 87. If the engine is running and a voltage exceeds 13 seconds , 2V (26.4V) is recorded by the microprocessor, the Copperhead will provide the connected consumers with voltage. The Copperhead also features surge protection for the 2nd battery and the connected accessories. If the dynamo voltage regulator fails, the charging voltage will increase well above the maximum permitted battery voltage. This may damage the battery and the connected consumers. If the Copperhead registers too high voltage, it will open the relay immediately and prevent unnecessary damage! With the Dutch manual, the Copperhead is easy to mount on any vehicle without the need for adjustments to the cable and / or electronics of the vehicle! Fast: <11.8V (12V) / 23.6V (24V) after 4 sec.